(MissionNewswire) Donor funding through Salesian Missions, the U.S. development arm of the Salesians of Don Bosco, has aided 12 families engaged in the Bosco Tea project. The Bosco Tea project is also funded by the Anma Integrated Development Association (AIDA), the development wing of the Dimapur Province of the Salesians of Don Bosco, and was developed in 2008 to help tea garden laborers in Assam, a state in northeastern India. The area is known for its wildlife, archeological sites and tea plantations. To date, the project has helped more than 700 families. Through Salesian Missions donor funding, 12 recipients who began organic tea gardens were each provided 2,000 to 3,000 saplings. They each prepared a plot of land and then had the delivery of saplings, which were planted with the assistance of Bosco Tea project staff. Salesian staff also directed them how to take care of the tea plants and the garden using organic methods. Mariam and Athnas Minj, recipients of the donation, now have a very successful tea garden. The Minjs have started plucking green tea leaves from their young tea garden seven days a week. They are plucking around 30 to 40 kgs per plucking day, and their garden is the best producing garden among the 12. Money they are receiving from the sale of green tea leaves is used for their children’s education and household expenses. 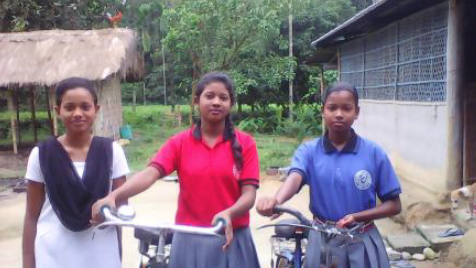 Three of their four children attend the Don Bosco School Longding – Arunachal Pradesh. India is one of the largest tea producers in the world with close to 70 percent of its tea consumed within India itself. The Indian tea industry has grown to own many global tea brands and has evolved into one of the most technologically equipped tea industries in the world. The districts of Golaghat, Sibsagar, Dibrugarh and Tinsukia in Assam have a large number of tea estates. The tea estates are tended to by laborers who despite working long hours, often do not make enough wages to meet their basic needs or escape poverty. Many tea laborers own their own small parcels of land but, for various reasons, leave the land uncultivated while they leave home to work at larger tea estates. In times of financial crisis, they are often forced to mortgage their land for small loans and when they are unable to repay the loans, the land is forfeited. Salesian missionaries in India, aware of this difficult situation, are working to provide opportunities for tea laborers to break the cycle of poverty. Laborers are also taught business and technical skills relating to the tea market and, capitalizing on their years of working on larger tea estates, they are able to develop a sustainable income to help them escape poverty. Many former laborers have developed stronger self-confidence and a renewed sense of dignity through the project.